Scout is an amazing toy for my kiddos! I love the fact that you can personalize this product just for your child so it says your child?s name and also says the spelling. Also it has loads of learning features which is also helpful in with the learning process! Easy to clean, not huge, not to pricey, totally worth the money! Batteries last forever and my kiddos play with it all the time! Highly recommend! This toys will sing so many song and we love to sing all of them. My daughter will play with the dog over and over again. The puppy was awesome for 2 years but then something in it?s computer function is not working and it repeats its self a lot and says the opposite of what it is supposed to for each hand . My 2 year old has this an loves it. I like that I can change the features from time to time. Helps him learn new things. My 6 year old still has and uses his scout every night with its ten minutes of bedtime music. He loves that its still all the things he liked from when he first got it as a baby. Scout is one of the best! Another great toy from LeapFrog! I bought this toy for my 9 month old son. He and I absolutely love it! 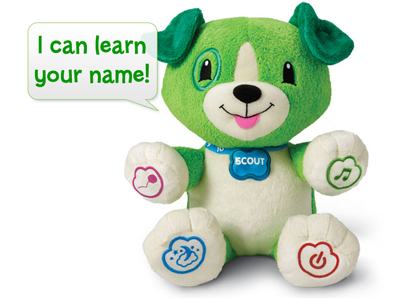 You can input your childs name into Scout and he will sing a song about them. You can also put in favorite food, animal, and color . I love the bedtime 5,10, or 20 increments. This toy keeps my baby entertained for a few and I feel good knowing its educational! My son loves his scout dog, has had it for two years. It was easy to hook up to the computer and input his name. Would be nice to be able to program him from my smart phone. But overall great for kids age 2-4. We got this for our daughter when she was a baby and she loved it! The ability to connect this to a computer and personalize it is what sets it apart in my opinion. The only problem we had was our daughter's name was unique so the computer wasn't able to pronounce it, but it still did the song to help her learn how to spell it. I love the variety of songs and learning tools.